The avoidance of waste has a long history within the manufacturing industry. In fact, many of the concepts now seen as key to lean have been discovered and rediscovered over the years by others in their search to reduce waste. Lean manufacturing, as management philosophy, came mostly from the Toyota Production System (TPS). The term “lean” was first introduced in article “Triumph of the Lean Production System” written by John Krafcik in 1988. Article was based on his master’s thesis at the MIT Sloan School of Management. Before his studies Krafcik had worked as a quality engineer in the Toyota-GM NUMMI. This aids in exposing problems systematically and makes it easier to use the right tools where the ideal cannot be achieved. Taiichi Ohno is the Japanese industrial engineer and businessman, considered to be the father of the Toyota Production System, who offered to focus on reduction of the original Toyota seven wastes to improve overall customer value. Some of these methods claim to be an independent manufacturing concept (such as kaizen and kanban). One way to cope with wastes and effectively increase profitability is a 5s. The name of this method uses a list of five words, which all start with the letter “S”: straighten, sort, standardize, shine, and sustain. It is translation from original Japanese words: seiton, seiri, seiketsu, seiso, and shitsuke. These words describe ways of workspace organisation for achieving the most effectiveness and efficiency. It include identifying and storing of the used items, maintaining the items and area, and sustaining the new order. Sort: Sort out and separate what is needed and not needed within the area. Straighten: Arrange items that are needed so that they are ready and easy to use. Clearly identify locations for all items so that anyone can find them and return them once the task is completed. Sustain: Keep to the rules in order to maintain the standard and continuously improve every day. The other way to waste reduction was a kanban. In 1952, Taiichi Ohno invented a kanban system at Toyota, as a system to improve and maintain a high level of production. Kanban became an effective tool to support running a production system as a whole, and an excellent way to promote improvement. One of the main benefits of kanban system is to establish an upper limit to the work in progress inventory, avoiding overloading of the manufacturing system. The concept of “to do” – “doing” – “done” became the cornerstone of many online tools used for managing projects and control workflows. Kanbanchi is one of such tools that supports kanban methodology, if you are interested, you can try to use it now. A Later process picks up the number of items indicated by the kanban at the earlier process. The Earlier process produces items in the quantity and sequence indicated by the kanban. Value stream mapping usually employs standard symbols to represent items and processes. A VSM is best created by using a pencil and drawing by hand on a sheet of A3 paper, as you will need to make frequent corrections and changes. Even in the late 1990s these techniques were largely unknown outside of Toyota. Perhaps VSM is a relatively recent addition to the TPS toolbox. John Shook and Mike Rother co-authored the book “Learning to See”, published by the Lean Enterprise Institute. This is what made the material and information flow widely accessible for application outside of Toyota. Value stream mapping is a flexible tool that lets us put all of the information into one place in a manner that is not possible with process mapping or other tools. Read this article to learn about creating a value stream map. Sigma is a mathematical term that measures a process deviation from perfection. Like Kaizen, Six Sigma is a management philosophy focused on making continuous improvements and bringing improvements into various processes. It was first introduced in 1986 by Bill Smith at Motorola. Unlike Kaizen, which has the primary goal of increasing efficiency of all aspects of processes, Six Sigma focuses on improving quality of the final product by finding and eliminating causes of defects. 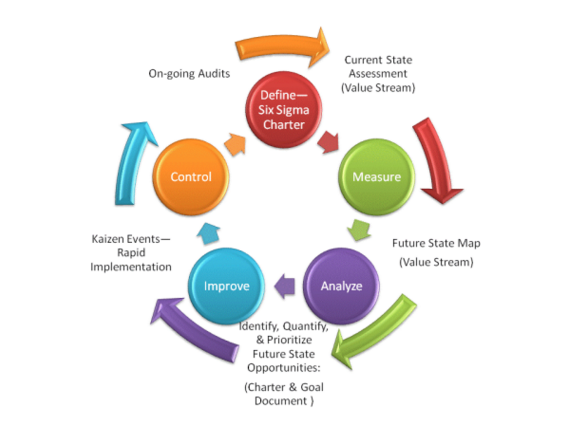 Six Sigma uses more statistical analyses than Kaizen and aims for as close to zero defects as possible. A sigma rating describes the maturity of a manufacturing process by indicating its percentage or yield of defect-free products it creates. Organizations need to determine an appropriate sigma level for each of their most important processes and strive to achieve these. The core tool used to drive Six Sigma projects is the DMAIC improvement cycle. DMAIC is an abbreviation of the five improvement steps it comprises: Define, Measure, Analyze, Improve and Control. All of the DMAIC process steps are required and always proceed in the given order. DMAIC refers to a data-driven improvement cycle used for improving, optimizing and stabilizing business processes and designs. DMAIC is not exclusive to Six Sigma and can be used as the framework for other improvement applications. At the end of the 1990s over 60% of organisations with a Fortune 500 status started to apply Six Sigma. Motorola has declared about $17 billion in savings since 2006 as a direct result of implementing Six Sigma. In recent years by efforts of some practitioners there was created the methodology which combines Six Sigma ideas with lean manufacturing. The Lean Six Sigma methodology includes Six Sigma, with its focus on variation and design, and lean manufacturing, which addresses process flow and waste issues as complementary disciplines aimed at promoting business and operational effectiveness. Dolphin Research Center goes Lean with Kanbanchi. Thank you very much, now I get the meaning!